It has been an extremely busy few months for us, having co-organised four History & Genealogy Expo’s this year. The first and second of them were both in June, the third in July, and now we come to our last one for the year … Unlock the Past’s Victorian Expo at Geelong in September. This will be a MAJOR history-genealogy-heritage event for not only those in and around Geelong, but Victoria as a whole. In saying that, I also know of some who will be travelling from interstate just for the event, as for the genealogy-minded people, this 2 day event will be something not to be missed. The Expo features a large exhibition of about 70 exhibitors which will be a unique opportunity to see so many organisations together in the one place. There’s numerous genealogy societies from which you’ll be able to find out what types of records they hold as well as join up if you’d like, museums with amazing collections, you’ll also be able to see the latest products from various genealogy retailers (including yours truly ‘Gould Genelaogy & History’), find out how to preserve your precious heirlooms, get your photos restored, look for your ancestors on various online websites, discuss printing your family history book, and learn how to use a genealogy program and so much more. View the full list of exhibitors here. If you can drag youself away from the exhibition, and make your way to the meetings, you’ll be able to hear 24 expert presenters from four states speak on a variety of topics like asylums, It’s not all online, DNA for genealogists, Ancestry.com.au, FamilySearch, Soldier settlement in Victoria, Researching Irish immigrant women, 1942: War comes to Australia, Museum treasures, Sewerage records, just to mention a few. View the full program schedule here. The Research Zone area is ALWAYS a popular one at the Expos. If you have a brickwall you’re stuck on, want to know more about a specific genealogy software program, or have a lookup done on Genes Reunited, Findmypast.co.uk, Findmypast.com.au or ScotlandsPeople websites – be sure to take the time to visit the Research Zone. The lovely people on hand will be able to help you with advice on numerous other topics as well, such as online genealogy courses, convict research, Australian and English research, DNA and more. Set up in the exhibition area, the tables will be attended thoughtout the Expo. View details of the Research Zone here (scroll to the bottom). All attendees will receive a Registration Kit which will include information and special offers from exhibitors and sponsors, together with eligibility to $1000s of dollars worth of Expo prizes and more. There are two prize draws (one on each day). As a bonus, everyone who Pre-Registers is automatically entered the Friday draw. View the listing of prizes and special offers here. I recommend pre-booking, as not only will you save money, but you are also then guaranteed to get into the talks you wish to attend. 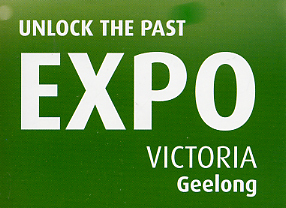 Come along to the Unlock the Past History & Genealogy Expo in Geelong – you won’t be disappointed. You can find more information, together with the online booking form on the Unlock The Past website.